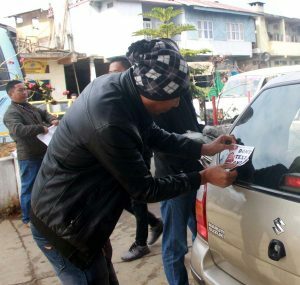 AMAM members and transport officials pasting sticker on a car on the occasion of 30th national road safety week at Imkongmeren Sports Complex, Mokokchung town, on February 9. Dimapur, Feb. 10 (EMN): Adventure and Motorsports Association Mokokchung (AMAM) observed the 30th national road safety week in collaboration with the transport office, Mokokchung, on February 9. To mark the occasion, members from AMAM and transport officials initiated sticker and banner campaign in which more than 900 stickers were pasted in vehicles at various locations to spread awareness of the road safety week. Banners were also placed at strategic locations around Mokokchung town. B Chekum Chang, road safety enforcement officer, Mokokchung, informed that the department had received nine road incidents during 2018. He also added that the initiative was undertaken to make public aware of road safety. It may be mentioned that AMAM, as an active motorsports association in the district, took up the campaign as a social responsibility to sensitise both the pedestrians and drivers on road safety measures.